If the rumours are to be believed Games Workshop publishes a new edition of Warhammer Fantasy Battles during this summer. I am one of those who actually believe that Fantasy Flight Games might rekindle their ownership on the rpg version of Warhammer. There is nothing to prove this (so it isn’t even a rumour) and I have been known to be wrong before. But still I think it could happen. This post is not about speculating of what would, could or should happen. 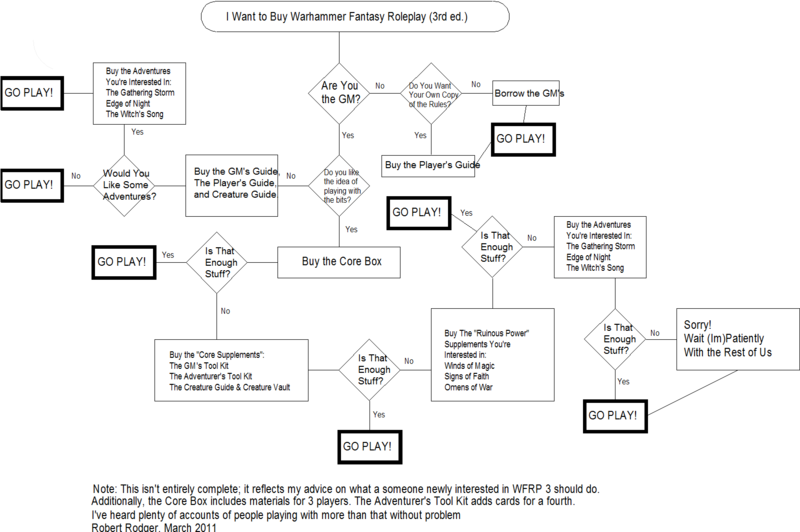 As someone who has been playing Warhammer Fantasy Roleplaying game through each edition I thought I could summarise some of my experiences with it. I must begin this post with a statement: from all three editions I think that the third one was the best as a game. As I have been a part of the Warhammer community a long time (not as long as a player, but still long enough) I know that a statement like that usually ignites a flamewar. I base my opinion mainly on the fact that 1st and 2nd edition are considered to be quite broken and to the fact that I really liked the way 3rd edition created new things to play with and gave us neat tools to tell a story. Even still during this summer we will play at least one session of Warhammer Fantasy Roleplaying game (henceforth WFRP) and we will be using the 2nd edition. Even though I really liked the 3rd edition it had a serious problem of being too broken up to different products. There was too much of everything to be handled properly. But the core of the system was one of the best I have ever played or GMed. The third edition was a really bold move from the Fantasy Flight Games. It didn’t resemble the previous versions at all and this was too big of a turnoff for some. I was actually really upset when the first previews of the new game were published all those years ago. But I didn’t let that upset me. I bought the game, played it and grew to love the whacky mechanics with large dice-pools and handy cards. Now I haven’t tried the Star Wars games yet but judging them “by their covers” it seems FFG refined the gaming system from WFRP to it. As Star Wars hasn’t been a big thing for me ever I have not paid any attention to their success but by what I have heard they are quite popular. Now it might actually be the time to get to the point of this post (it actually has one!). As I said we’ll be playing the second edition this year. And even with the Zweihänder looming ever closer on the horizon we wanted to use 2nd edition mainly for its flaws. It is not nick-named “the game of failures” in our group without a reason. The product family of the WFRP 2nd edition is quite huge. It missed some key-points that would have made it excellent like sourcebooks for Wood Elves, Tilea and Norsca (though luckily these examples have been covered by the fan community). Nevertheless there are over 20 different books published for WFRP2. And by three different publishers if my memory serves me right. The power duo for great games is simple: you need the corebook (naturally) and the Tome of Corruption. The later gives you enough to go for including additions to magic, large tables of chaos mutations (for who wouldn’t want those? ), dangerous monsters and tainted new careers. All other books pale in comparison to the usefulness of this Tome. When you want to get deeper in the game the obligatory Old World Armoury and Old World Bestiary add nice flavour for the soup. If money is burning holes into your pockets you could also buy the Career Compendium that lists (most) of the official careers in the whole edition. It isn’t that necessary for the GM (though it does give adventure hooks for each career) but for players wanting to plan their career path it makes things a lot simpler than browsing through all of those other books. For GMs wanting to run published adventures… I’m not saying that they are bad but they leave a lot to hope for. The Paths of the Damned trilogy could be nice and they do give you extra info on the largest of cities in the Empire. But it simply lacks the sense of grim and perilous journey Warhammer should be about. The Thousand Thrones is kinda gets it (more) right but has plot holes and a terrible ending. A fan project was launched years ago to add a lot of substance to it but it never finished. From the smaller adventures Terror in Talabheim is certainly interesting and Plundered Vaults has many of the most classic 1st edition adventures. Though sadly without original images (and some have been even altered quite much). As for the other products it all depends of what kind of campaign you would be running/playing. In my opinion Tome of Salvation (the big book for Priests) and Realms of Magic (the tome for wizards) are too big of a mess and bring in too little for a common group to be useful. Someone wanting to play a wizard or priest could benefit of them but not as much as one could expect from these kind of books. The same goes for Night’s Dark Masters (the vampire book) and The Children of the HornedRat (the Skaven book). I happened to buy them when they were published (now they are insanely expensive) but I haven’t actually even used NDM. Ever. The CotHR has been a constant companion on our gaming table but that’s mainly because I like the ratmen (having played them in Fantasy Battle). Realms of the Ice Queen and Knights of the Grail expand your gaming environment to Kislev and Bretonnia but bring little more to the table if you are not expecting to actually play in those realms. KotG is the worse of the two resembling the Sigmar’s Heirs by spending most of the book describing useless facts of the nation they depict. The bottom feeders of the whole line (to me) are The Lure of the Liche Lord (a dungeon brawl in a deadly pyramid; though it has a better villain than most of the other adventures) and Old World Companion (that some people just love even though the rules it presents are almost useless). The best thing in Warhammer Fantasy Roleplay (no matter the edition) is the active community. I have yet to encounter as dedicated bunch of (mostly) likeminded individuals that love their game and want to make it better. So if you are planing on trying Warhammer and don’t want to see, if something new comes out or is announced this summer familiarise yourself with the differences between each edition and pick up your favourite. The good people at Strike-to-Stun will give you a hand when needed. This entry was posted in Roleplaying Games and tagged books, fantasy, Fantasy Flight Games, Games Workshop, rpg, skaven, speculation, Warhammer Fantasy Battle, Warhammer Fantasy Roleplay, WFRP by Lauri Maijala. Bookmark the permalink.